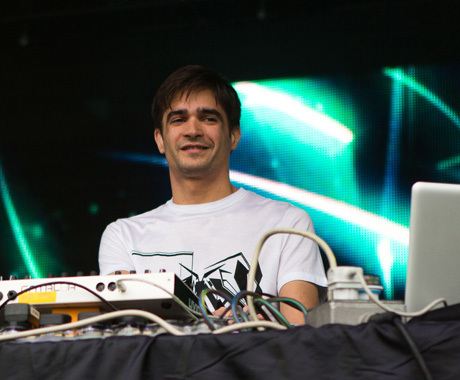 British beatmaker Jon Hopkins may have been relegated near the bottom of the lineup at Toronto's TIME Festival, but his Saturday afternoon performance ended up being the highlight of the entire day. Known at home and abroad for his cacophonous and crushing instrumentation, the spindly Hopkins pummeled his laptops and trigger pads with the kind of resourceful precision commonly associated with a classically trained pianist. Fans of last year's Immunity we're not disappointed, as the album's Eno-esque soundcapes and crackling distortion decimated the festival grounds with tracks like "We Disappear," "Collider" and "Open Eye Signal" collapsing and combining out of shards of one another to create one of the more creative sets seen on the festival ground in quite some time. Adding to the ambience was a refined light show and backdrop that emphasized the darker hues of the Immunity album cover. Every light on the stage bathed the crowd and its captain in a purple hue, while cinematic scenes of a skateboarder on a highway, fracturing geometric patterns and an overcast desert illuminated the background and over-saturated the audience ahead of it. Waking the crowd from its industrial cocoon was a rousing "Light Through the Veins," which was thankfully played out to its full nine-minute length. As the sun broke through the clouds for the first time all day, it was hard not to see Hopkins, sweaty appendages, beaming smile and all, as some sort of beacon of light in the mostly mindless EDM fog that is currently transpiring over electronic music today. Watch Jon Hopkins' Video for "Singularity"